William Lambers is an author who partnered with the UN World Food Programme on the book Ending World Hunger. His writing have been published by the New York Times, Boston Globe, Huffington Post, San Diego Union Tribune, Cleveland Plain Dealer, Des Moines Register, Seattle Times, Cincinnati Enquirer and the Buffalo News. This holiday season there is a gathering storm of famine. El Nino related drought threatens over ten million with food shortages in Ethiopia. Millions of war victims are starving in Syria, Iraq, South Sudan and Yemen. These hunger emergencies demand the world’s attention. We can look to history for inspiration and remember America's greatest Christmas gift. It was 1921 in Russia and an AP journalist had just attended a mass in the town of Volsk. As he was leaving the church, the priest rushed after him. He had a message he wanted the reporter to share with America: Please send food and save us from starvation! A famine had struck Russia. People were starving to death. The aftermath of World War One, civil war, drought and failed policies left tens of millions of Russians with no food. Desperate civilians were eating grass or anything they could find. An American officer told of hospital patients crying out for bread. But there was just no food available for anyone. It's hard to picture this ghastly scenario in our world, especially during the holidays when food is so abundant. But famine happened in Russia in 1921 and America was their only hope for rescue. When the call for help was first heard, America quickly responded. Led by Herbert Hoover, the American Relief Administration (ARA) started a feeding program for a million Russian children. To get served rice daily was a life-saver for those children. 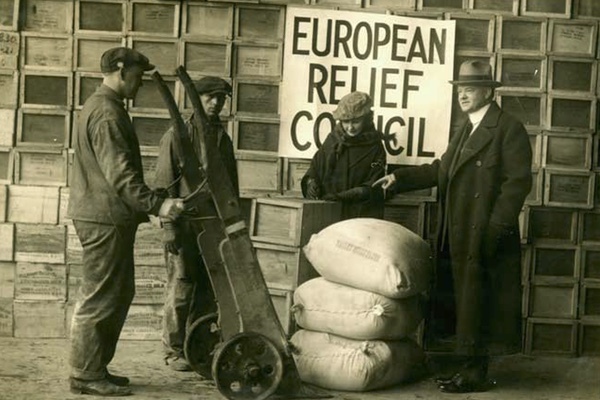 The ARA had supplies and experience from feeding children in Europe after World War One. But Colonel William Haskell and other ARA officers were witnessing an emergency of epic proportions unfolding in Russia. It became clear that much more aid would be needed. As Christmas of 1921 was approaching, Hoover urged quick action by Congress to get more food on the way to the famine zone. President Warren Harding was in support. The food aid package was approved right before Christmas. A New York Times editorial called it "America's Christmas Gift.” Corn, seed grain and milk worth 20 million dollars would bolster the relief in Russia. Americans worked through the holidays to get the ships on the way to Russia by early January. Millions would be saved by the food. Charities worked throughout Russia to help distribute the aid. The Russian author Maxim Gorky wrote to Hoover thanking America for saving so many lives with the food shipments. Gorky wrote, "In all the history of human suffering I know of . . . no accomplishment which in terms of magnitude and generosity can be compared to the relief that you have actually accomplished. . . . Your help will be inscribed in history as a unique, gigantic accomplishment worthy of the greatest glory and will long remain in the memory of millions of Russians . . . whom you saved from death." Famine is tragically not limited to history. In fact, today in war-torn Syria people are starving to death. The U.S. and Russia are each bombing targets inside Syria, but what the people need most is peace and food. The UN World Food Programme (WFP) is trying to feed 7 million Syrians who have lost their food supply because of the war. But many Syrians cannot get this help because the violence prevents aid convoys from reaching them. In South Sudan, Iraq and Yemen war has also caused extreme food shortages. There are more hungry refugees now than anytime since World War II. The worst drought in 50 years has just struck Ethiopia. There is fear of a famine in 2016. Save the Children just issued a powerful statement saying we must act now to prevent another tragedy in Ethiopia and East Africa. In Central America drought has also ruined food supplies. For this holiday season no gift from America could be greater than food for the starving people around the world. In fact, the Congress holds the power to send this lifeline to millions. The Congress should do what preceding generations have done in times of world crisis: increase funding for America’s international food aid programs. Congress could boost the Food for Peace and the McGovern-Dole global school lunch programs. Like Congress did with the Russian Famine of 1921, take action to send food to the world's hungry. Such a powerful action this holiday would save lives and rescue children from deadly malnutrition. American humanitarianism is the strongest instrument for goodwill and peace on earth.